Was Your Ancestor a Physician? At a3Genealogy we are hooked on researching “off-beat” collections. When researching U. S. Army Surgeon General’s Office Autobiographical Sketches of Medical Officers, or the National League for Nursing records, or the U. S. Army Surgeon General’s Office Autobiographical Sketches of Naval Medical Officers we turn to the U. S. National Library of Medicine Archival and Manuscript (NLM)Collections. Our favorite collection at the NLM is The American Medical Association (AMA) Deceased Physicians Master Card File. What Are Deceased Physicians Master Card File? Did your physician ancestor disappear? Or, are there large holes in your ancestor’s life story? The 350,000 physicians biographical cards may hold the answers. Physician biographical cards were collected and maintained by the AMA. The American Medical Association, established in 1847, created a medical directory of its members. The first woman became a member in 1876. African American physicians were not included until about 1888. Read: African American Physicians and Organized Medicine, 1846 - 1968. The American Medical Directory was expanded to all physicians in 1906. 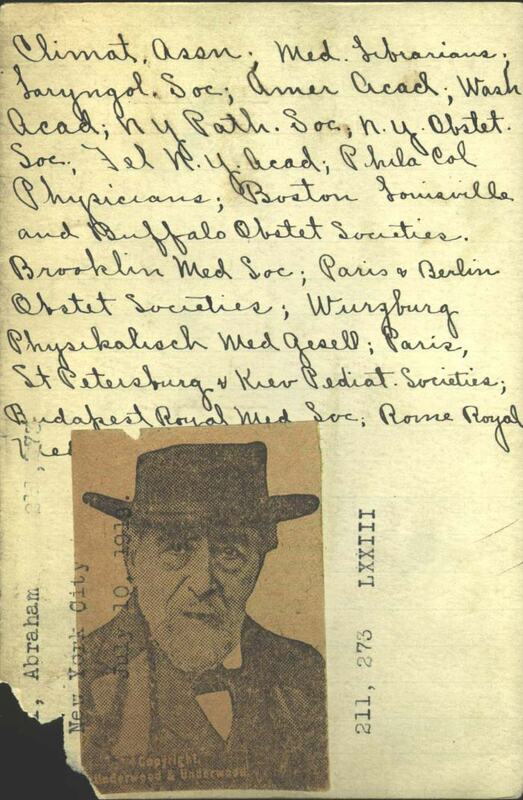 The original collection of physician information was written on cards which were compiled into The Medical Directory. The information on these 4x6 cards included those who died between 1906-1969,. Researchers will find death notices and biographies of their physician ancestors who were born as early as 1850ish, to include those who graduated after 1865. These 350,000 physical files were archived in the AMA Deceased Physicians Masterfile and published in two volumes: Directory of Deceased American Physicians 1804 - 1929. Once compiled these original cards were discarded and not salvaged. 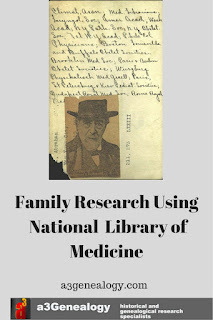 However, the 1864 - 1968 AMA Deceased Physician File (AMA) cards are digitized and can be retrieved from FamilySearch.org. Biographical notes of physicians after 1969 to present are maintained in a computer database. 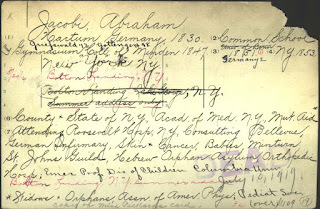 Abraham Jacobi: Place of birth and date and countries and places of Practices to NY with photo. In addition to “education, state licensing, and place of practice," researchers may also find their ancestors’ obituary citations, and even a noted cause of death. a3Genealogy researchers have crashed more than one brickwall while conducting immigrant research. From where in Germany was that ancestor? Did they practice overseas? We have also seen ancestor’s card chocked full of controversial notes. Researchers may find a photo of their ancestor, immigrant’s place of birth, overseas practices, and even immigration information. 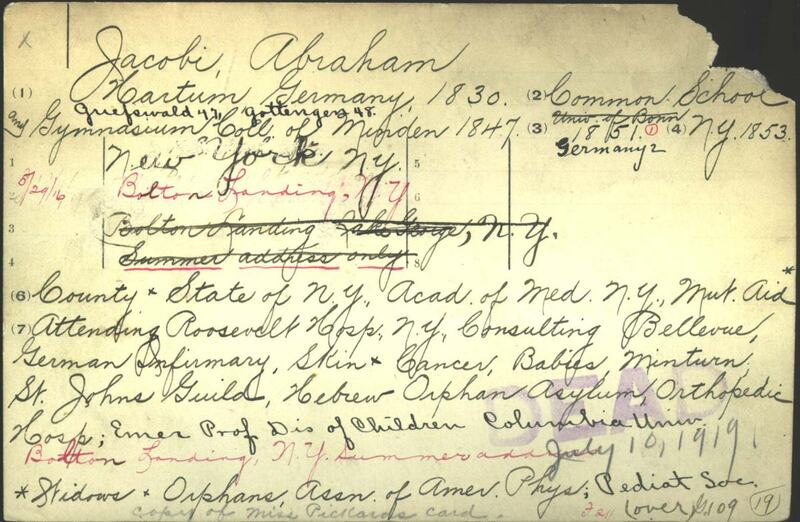 One ancestor’s file had a cryptic hint of why he moved from New York to South Carolina. A subsequent newspaper search was able to confirm and fill in the physician’s life experience. For those looking for their African American ancestors the cards may not list early hospital practices since only AMA physicians could practice in the hospitals. It is important to note that the National Medical Association (NMA) founded in 1895 was an alternative to the "white-only" American Medical Association (AMA). For more information read: Creating a Segregated Medical Profession: African American Physicians and Organized Medicine, 1846 - 1910. · 1804 - 1929 Directory is held at the AMA Archives in Chicago. 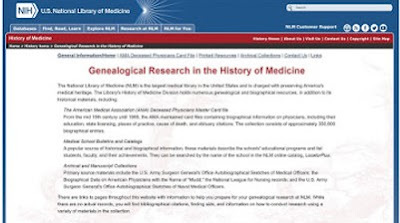 This collection holds 149.000 physician biographical information. Original cards are not available. Ancestry.com has extracted the information from the Masterfile database. · 1864 - 1968 AMA Deceased Physician File (AMA) cards are digitized and can be retrieved from FamilySearch.org. · 1969 - Present. The AMA Unified Service Center, Chicago, IL, holds and maintains the 1969 to present biographical information on computer database. Thanks to the Archival Librarians for a3Genealogy interview on Dec 2016.